Preheat oven to 325 degrees F (165 degrees C). Clean turkey (discard giblets and organs), and place in a roasting pan with a lid. In a small bowl, combine olive oil, garlic powder, dried basil, ground sage, salt, and black pepper. Using a basting brush, apply the mixture to the outside of the uncooked turkey. Pour water into the bottom of the roasting pan, and cover. Bake for 3 to 3 1/2 hours, or until the internal temperature of the thickest part of the thigh measures 180 degrees F (82 degrees C). 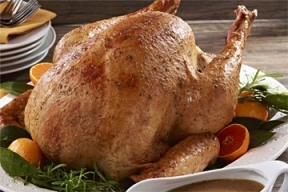 Remove bird from oven, and allow to stand for about 30 minutes before carving.